1. Take a day trip. Coach seats on Amtrak and VIA Rail are very reasonable. It’s when parents book passage in the sleeper cars that rates skyrocket. We don’t advise booking coach tickets for overnight travel with young kids—trust us, you’ll be miserable—but day journeys are perfectly comfortable in coach class. We like to utilize Amtrak to commute from our hometown in Southern Oregon to Portland International Airport (PDX) for more affordable air tickets, and save on long term parking fees. The trip takes us six hours (instead of the usual four by car) but no one has to drive, the kids enjoy the scenery through the Cascades, and we make up the train fare in the lack of parking fees. As coach passengers, families don’t get meals included, but food packed from home is permitted, and a lounge car always has causal meals and snacks on offer. On Amtrak, when all sleeper car passengers have booked their meal reservations in the dining car, the crew opens reservations for coach passengers. Dining car meals are a fun affair, but costly. Parents pay a la carte if traveling coach. We find a happy medium bringing our our lunch and supplementing with a treat from the lounge. 2. Book early for Super Saver tickets. Unlike air travel, for which the best ticket prices are usually offered during a 6-8 week window pre-trip, families can save the most by booking rail tickets as far ahead as possible. Look for Super Saver tickets, or book your train travel in the off-season. In June-August, families will pay top dollar for both coach and sleeper tickets. 3. Try a single overnight. If your crew really wants to spend the night on the train—and yes, it is fun—24 hours is usually enough. We spent a memorable day and night riding VIA Rail’s Canadian route, and while we loved watching the stunning scenery go by and enjoying the dining car and comfortable berths (yes, really! ), we were more than ready to hop off and stretch our legs after 24 hours. Check Amtrak and VIA Rail routes online to find a one-night itinerary that works for your family: there are more station stops than most people realize. If you have a tight schedule, this is not the time for a rail trip. 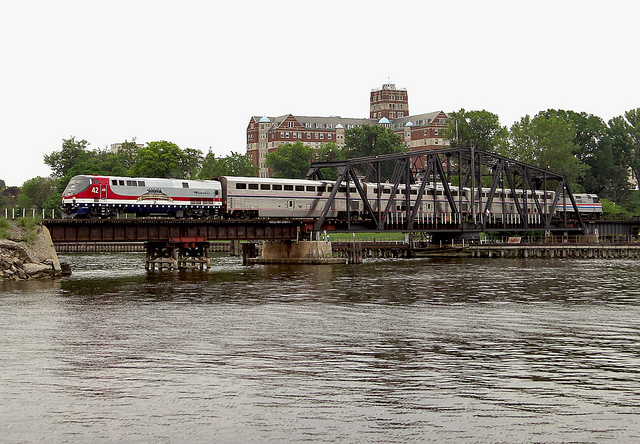 Amtrak runs at its own pace, stopping en route for freight trains (they have priority), at stations, and slowing through towns. Becoming behind schedule is the norm. We never book a rail trip on the same day of a flight departure. Coach passengers are usually offered electrical outlets at each seat, plus pillows and blankets. Seats recline and have foot rests. A lounge car offers snack foods and ceiling to floor windows. Restrooms are in every car. Sleeper passengers also enjoy access to a parlor car with additional dining, a dining car with included meals (3x daily) and wifi. Check the information on the train you’ll be taking online before you go. Amtrak and VIA Rail both offer checked luggage service, but in our personal experience, getting your luggage back can take a while. Because passengers are allowed two carry-ons (just like when flying), and there’s ample space for your carry-on (unlike when flying), we recommend carrying luggage on board. Our kids love taking photos aboard trains, and the freedom of movement afforded by rail travel makes it possible for kids to walk from car to car taking photos. In most lounge cars, docents are on-hand to offer knowledge about the vistas and landmarks passing outside the window. Encourage kids to ask questions or follow along on a map. Cars with public access, like lounge cars with great views, fill up fast. Usually, boarding a train is a casual affair, with ample time. Instead of sitting in the train station lounge until the last minute, board early to snag good seats. Because Amtrak considers the posted schedule only a suggestion (as noted, they are restricted by many factors, including freight schedules) it’s helpful to sign up for schedule change email alerts or texts. Knowledge of delays can save families from early wake-up calls or long waits. Have train travel tips to share? Leave them in the comments! I’ve yet to take a train trip with my kids. I think I need to plan one!